What a race! But before I tell you how the race ended, let me tell you how it started! Friday Matt and I picked up our bibs for the race and had a mini-date. Basically, we had time to have dinner out before we needed to be home and put the kiddos to bed. Saturday Matt got in a few miles and we spent the rest of the day playing with the kids on our new swingset and taking the girls to ballet class. I also packed because as I write this I am in The Hague for work. Sunday the alarm went off at 4am and we were out the door by 4:30am. As much as I want to complain about our early rise time, Karl, Matt's guide, got up at 3:20am. Yikes! We met up with Karl and took the bus to Mount Vernon and then we parted ways. 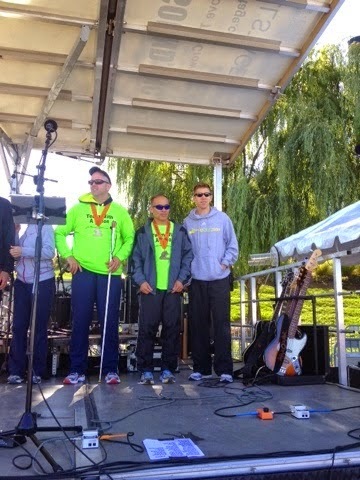 The race had an early start for the blind and visually impaired, but Matt always chooses to start in the main heat. He is good about getting right on the starting line to limit the people around him. I took my place in the middle of the pack. Some races have official corals, but this one just had recommended starting areas by anticipated pace. The course is a net downhill, but the first mile or so is a pretty steep downhill. There are a few minor rolling hills, but the biggest hill is the Wilson Bridge itself. Matt knew what to expect so he didn't start out too fast. He knew he'd need a kick later in the race. When Matt got to the bridge the sun hit him directly in the eyes so he had to run carefully. He had to remind himself that Karl was driving and Matt needed to focus on running and pace. Karl not only kept Matt from missing turns, but he also stopped him from getting hit by a Mini that turned into the race course in Old Town Alexandria. The driver must have missed the fact that 4,000 runners were in his way. 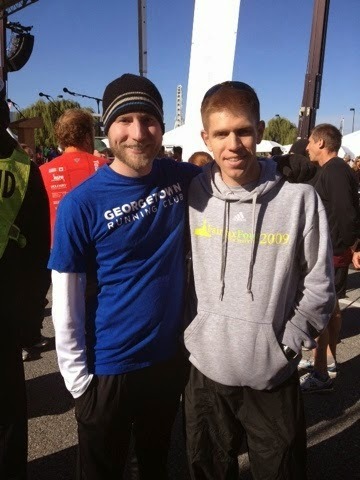 Matt and Karl were at the finish to cheer me on and then we waited until the awards ceremony. 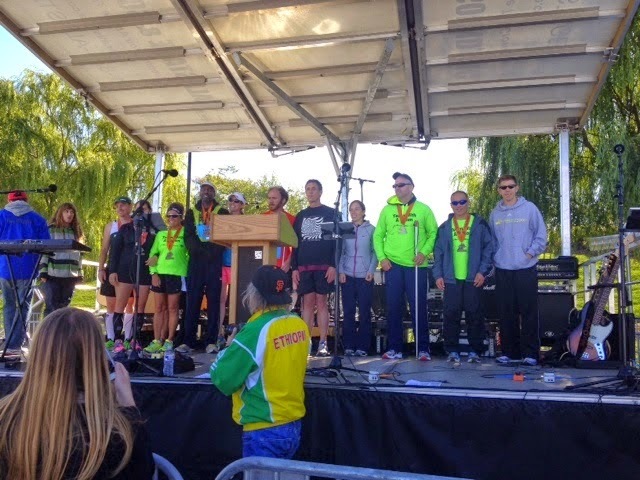 It was a wonderful moment watching Matt up on the stage with all of the other blind and visually impaired runners. It was a beautiful collection of athletes cheering each other on and congratulating one another. I loved being there as he relished in his special moment. It never gets old. 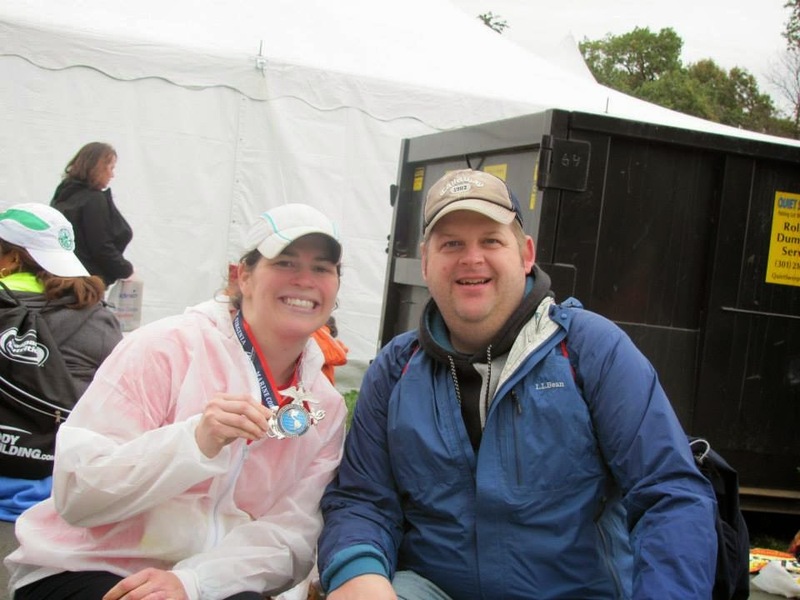 Matt will be running a 5k in November, but his next big race that he will focus his training on is the California International Marathon in December. I have a feeling he will be having a similarly awesome race! Below are a few pictures from race day. Before I close, I would like to say thank you. Thank you to Karl for giving up your Sunday morning to run with Matt and giving him that extra bit of motivation that led him to a new half marathon best. Thank you to Pat, Chris, and Jeff for being our cheering section. Thank you to my mom for staying with our kids so we could run the same race for the first time since before they were born. Thank you to Elizabeth for the great training runs. 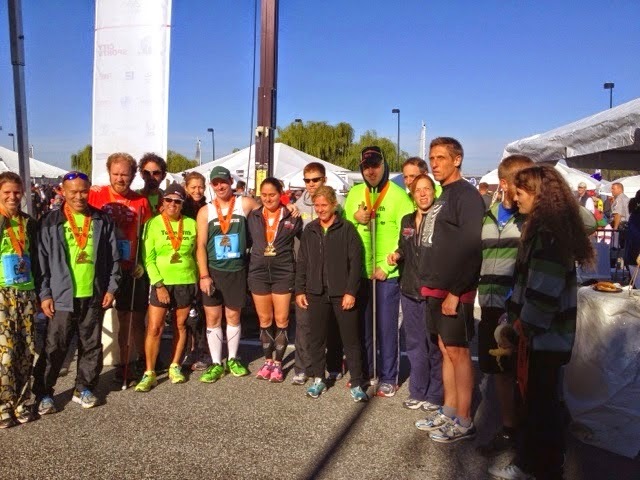 And thank you to everyone who came to the blog to see how Matt ran. We appreciate your support and words of encouragement. Rio feels one step closer now! I wrote the above after the race and before I learned the news that on a day that started so happy for my family ended so tragically. My dearest brother and life-long friend died unexpectedly of a heart attack that evening. He cheered me on at just about every race I have ever ran, biked miles and miles with me to help me train, and been the dearest, sweetest big brother my entire life. I love you Brian!